For other uses, see Lazarus (disambiguation). Lazarus is a free cross-platform visual integrated development environment (IDE) for rapid application development (RAD) using the Free Pascal compiler. Software developers use Lazarus to create native-code console and graphical user interface (GUI) applications for the desktop, and also for mobile devices, web applications, web services, visual components and function libraries for a number of different platforms, including Mac, Linux and Windows. An application created using Lazarus on one platform can generally compile and execute on any platform for which a Free Pascal compiler exists. For desktop applications a single source can target Mac, Linux, and Windows, with little or no modification. An example is the Lazarus IDE itself, created from a single code base and available on all major platforms including the Raspberry Pi. GUI widgets or visual components such as edit boxes, buttons, dialogs, menus, etc. Lazarus uses Free Pascal as its back-end compiler. Therefore, Lazarus can theoretically be used to develop applications for all platforms supported by Free Pascal. Lazarus provides a cross-platform application framework called the Lazarus Component Library (LCL), which provides a single, unified interface for programmers, with different platform-specific implementations. Using LCL, it is possible to create applications in a write once, compile anywhere manner, unless system-dependent features are used explicitly. As Free Pascal supports cross-compiling, Lazarus applications can be cross-compiled from Windows to Linux / macOS / etc. and vice versa. Applications for embedded devices (smartphones, PDAs, routers, game consoles) can be cross-compiled from any desktop platform. The standard application framework, Lazarus Component Library (LCL) was originally modeled after the Visual Component Library (VCL) in Delphi 6, and, unlike Delphi, is not restricted to Microsoft Windows operating systems. This is done by separating the definition of common widget classes and their widgetset-specific implementation. Each widget set is supported by providing an interface which interacts directly with the set. Developers can install packages that allow Lazarus to support several database management systems (DBMSes). Programs can interact with DBMSes through code or by components dropped on a form. Simple, local, flat file databases through TBufDataset, TMemDataset and TSdfDataset. Microsoft Office connectivity before FPC 2.6.0 release. Popping up Excel with a simple table filled out in 2.6.0 and higher works. No support to directly call .NET libraries;. It is possible to call Object Pascal code from .NET software. COM support was missing until version 2.2.0. Missing dynamically loadable packages support. Not 100 percent compatible with VCL. As mentioned previously this is by design, although the current LCL widget set should suffice for most applications. But this makes the deep repository of available VCL widgets inaccessible without conversion. The conversion effort mostly involves some editing, although there are a few fundamental differences. When porting, missing units in the libraries and COM support are a considerably bigger problem than incompatibilities between LCL and VCL. Like Free Pascal, Lazarus is free software. Different portions are distributed under different free software licenses, including GPL, LGPL, MPL, and a modified version of LGPL. Specifically, the LCL, which is statically built into the produced executables, is licensed under a modified version of the LGPL, granting extra permissions to allow it to be statically built into the produced software, including proprietary ones. Installing a design-time package is equivalent to linking to the IDE, thus distributing the Lazarus IDE with a GPL-incompatible design-time package (e.g. the JEDI packages, which are licensed under the Mozilla Public License) pre-installed would cause a license violation. This however does not prohibit proprietary packages from being developed with Lazarus. 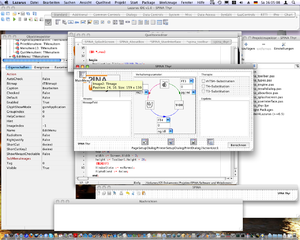 The first attempt to develop a visual IDE for Free Pascal dates back to 1998, when the Megido project commenced. For various reasons this approach failed. Some of Megido's developers then started a new project based on a more flexible foundation. The first preliminary LCL version was ready for release in 2001, and in 2003 the first beta version of Lazarus (0.9.0.3) was hosted at SourceForge. The first final Lazarus version (1.0) was released in 2012, and significantly enhanced Lazarus 1.2 with was released in 2014. More than four million downloads had been made from SourceForge as of March 2014. The name "Lazarus" alludes to the revival of the Megido concept. It is inspired by Lazarus of Bethany, who, according to the Gospel of John, was restored to life by Jesus four days after his death. Old version, no longer supported: 0.1 January 2001 Windows Redesign of component library to support platform-sensitive development for Linux and Windows using GTK+ and other widgetsets. Old version, no longer supported: 0.5 January 30, 2001 Windows, Linux Bug fixes and new features supporting cross-platform development and project skeletons. Old version, no longer supported: 0.8 October 9, 2001 Windows, Linux Codetools implemented, bug fixes. Old version, no longer supported: 0.8.2 January 17, 2002 Windows, Linux Expanded find functions. Old version, no longer supported: 0.8.4 August 19, 2002 Windows, Linux Improved graphics and font support, support for Delphi 6 syntax. Binary DFMs are now automatically converted to LFMs. Old version, no longer supported: 0.8.5 October 26, 2002 Windows, Linux LCL decoupled from interfaces. Old version, no longer supported: 0.9.1 February 27, 2004 Windows, Linux Support for packages, numerous added and enhanced properties. Old version, no longer supported: 0.9.12 February 7, 2006 Windows New packages for database support, CGI applications and printing. Old version, no longer supported: 0.9.18 September 23, 2006 Windows, Mac OS X (PPC), Linux Bugfixes, procedure list implemented, new command-line tool "lazbuild"
Old version, no longer supported: 0.9.20 November 5, 2006 Windows, Mac OS X (PPC), Linux Bufixes, code folding implemented, QT widgetset improved. Old version, no longer supported: 0.9.26 October 5, 2008 Windows, Mac OS X (Intel and PPC), Linux Internal graphic system was rewritten. LCL now uses Unicode strings encoded as UTF-8 on all platforms. FPDoc help in tooltips. First version to run natively using the Carbon widgetset on Mac OS X. Old version, no longer supported: 0.9.28.2 October 25, 2009 Windows, Mac OS X (Intel and PPC), Linux Mainly bug fixes. Old version, no longer supported: 0.9.30 March 22, 2011 Windows, Mac OS X (Intel and PPC), Linux Large number of new features, including docking and multiple source-code windows. Based on Free Pascal 2.4.2. Old version, no longer supported: 0.9.30.2RC1 September 30, 2011 Windows, Mac OS X (Intel and PPC), Linux Includes Free Pascal 2.4.4. Release candidate for Lazarus 0.9.30.2. Old version, no longer supported: 0.9.30.2RC2 October 26, 2011 Windows, Mac OS X (Intel and PPC), Linux Release candidate for Lazarus 0.9.30.2. Old version, no longer supported: 0.9.30.2 November 5, 2011 Windows, Mac OS X (Intel and PPC), Linux Bug fixes. Old version, no longer supported: 0.9.30.4RC1 March 3, 2012 Windows, Mac OS X (Intel and PPC), Linux Bug fixes, includes Free Pascal 2.6.0. Release candidate for Lazarus 0.9.30.4. Old version, no longer supported: 0.9.30.4RC2 March 7, 2012 Windows, Mac OS X (Intel and PPC), Linux Release candidate for Lazarus 0.9.30.4. Old version, no longer supported: 0.9.30.4RC3 March 11, 2012 Windows, Mac OS X (Intel and PPC), Linux Release candidate for Lazarus 0.9.30.4. Old version, no longer supported: 1.0RC1 July 29, 2012 Windows, Mac OS X (Intel), Linux Release candidate for Lazarus 1.0. Old version, no longer supported: 1.0RC2 August 21, 2012 Windows, Mac OS X (Intel and PPC), Linux Release candidate for Lazarus 1.0. Old version, no longer supported: 1.0 August 28, 2012 Windows, Mac OS X (Intel and PPC), Linux First final version. This stable release includes Free Pascal 2.6.0. Multiple corrections and improvements of the IDE, including a macro function, expanded code-folding and new debugger functions. Old version, no longer supported: 1.0.10 June 12, 2013 Windows, Mac OS X (Intel and PPC), Linux Bug fixes. Old version, no longer supported: 1.0.12 August 24, 2013 Windows, Mac OS X (Intel and PPC), Linux Bug fixes. Old version, no longer supported: 1.0.14 November 16, 2013 Windows, Mac OS X (Intel and PPC), Linux Bug fixes. Old version, no longer supported: 1.2.4 June 16, 2014 Windows, Mac OS X, BSD, Solaris, Linux Bug fix release. Old version, no longer supported: 1.2.6 October 12, 2014 Windows, Mac OS X, BSD, Solaris, Linux Bug fix release. Old version, no longer supported: 1.4.0 April 19, 2015 Windows, Mac OS X, BSD, Solaris, Linux Improvements of editor, resource handling and additional new features. Based on Free Pascal 2.6.4. Old version, no longer supported: 1.4.2 July 14, 2015 Windows, Mac OS X, BSD, Solaris, Linux Bug fix release. Old version, no longer supported: 1.4.4 October 4th, 2015 Windows, Mac OS X, BSD, Solaris, Linux Bug fix release. Old version, no longer supported: 1.6 February 18, 2016 Windows 32bit/64bit, Mac OS X, Linux Multiple new features, including docking, project groups and improved editor. Based on Free Pascal 3.0.0. Old version, no longer supported: 1.6.2 November 13, 2016 Windows 32bit/64bit, Mac OS X, Linux Bug fix release. Old version, no longer supported: 1.6.4 February 26, 2017 Windows 32bit/64bit, macOS, Linux Bug fix release. Based on Free Pascal 3.0.2. Old version, no longer supported: 1.8.0 December 6, 2017 Windows 32bit/64bit, macOS, BSD, Linux Major release with many new features including an online package manager. Based on Free Pascal 3.0.4. Old version, no longer supported: 1.8.2 February 28, 2018. Bug fix release. Old version, no longer supported: 1.8.4 May 22, 2018 Windows 32bit/64bit, macOS, BSD, Linux Bug fix release. Current stable version: 2.0.2 April 16, 2019 Windows 32bit/64bit, macOS, BSD, Linux Bug fix release. ASuite is a free open source application launcher for Windows. From 2.0 Alpha 2, it's fully written in Lazarus/FPC. Beyond Compare is a data comparison utility for Windows, macOS, and Linux. The macOS and Linux versions are compiled using Lazarus/FPC. Cartes du Ciel is a free planetarium program for Linux, macOS and Windows. The software maps out and labels most of the constellations, planets, and objects you can see with a telescope. It is fully written in Lazarus/FPC and released under GPL. Cheat Engine is an open source memory scanner/hex editor/debugger. It is useful for cheating in computer games. Since version 6.0 it is compiled with Lazarus/FPC. EPANET, a software package for modelling water distribution systems. HNSKY, Hallo Northern Sky is a free planetarium program for Windows and Linux. Since version 3.4.0 written & compiled with Lazarus/FPC. MyNotex is a free software for Gnu/Linux useful to take and to manage textual notes. Peazip is an open source archiver, made with Lazarus/FPC. TorChat is moving away from Python, and is being rewritten in Lazarus + Free Pascal. CudaText is a cross platform open source text editor. Coedit (renamed to Dexed) is an IDE for the D programming language. SimThyr is a continuous simulation program for thyroid homeostasis. GLScene is a free OpenGL-based library that provides visual components and objects allowing description and rendering of 3D scenes. OpenWire is an open-source library that allows pin type properties to make connections between LCL components similar to LabVIEW or Agilent VEE. ^ ""COPYING.txt" file from the online source code repository". ^ "In which language is TC written??". Ghisler.ch. 2010-08-09. Retrieved 2016-08-11. Wikimedia Commons has media related to Lazarus (software).